Bike thieves are the lowest of the low. Pure scum. So it’s with delight that we get to watch these sub-human pieces of you-know-what get their asses handed to them thanks to the boys over at TwinzTV. 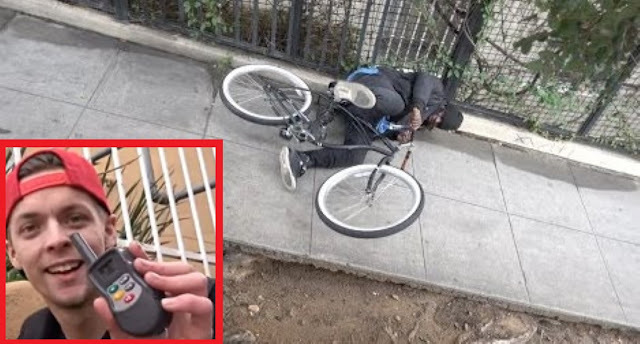 They set up the ultimate bait bike where thieves actually get shocked once they steal the bike and start riding. They have sensors hooked up to the handlebars and to the seat so once these idiots make their getaway and get comfortable sitting down, wham! They receive an electric shock so powerful it knocks them clear off the bike! These guys not only know how to prank, they know how to call out bike thieves and give them a taste of what they deserve. There’s nothing worse than walking out and seeing that your bike’s been ripped. But there’s nothing better than seeing these fools flip over the bike they stole because they just got electrocuted! Great stuff!